If you have been told by your doctor that you have high FSH or your eggs are too old, you may feel that your only options donor eggs, or adoption. Despite what you may have heard, science is now showing that it may be possible to improve your egg quality. A study published in Reproductive Biology and Endocrinology on biological versus chronological ovarian age shows that both environmental and genetic factors contribute to egg quantity and quality, and that biological age is more important than chronological age in predicting the outcome of in vitro fertilization. Your chronological age is determined by how many birthdays you’ve had and there is nothing you can do about that except to celebrate! But your biological age — how well your body systems function, including your egg quality, compared to others that are the same age -- appears to be something that you can influence with your diet, mind body stress reduction, lifestyle and laser acupuncture (LLLT). Our treatment approach at Acubalance is to optimize your body’s internal environment during the crucial 3-6 month period in which the follicles are recruited and mature before being ovulated or retrieved in an IVF cycle. Even with proper diet, exercise, calmness, acupuncture and supplements, some men and women will require the use of donor sperm, donor eggs, and IVF. But by living in a way that promotes peak fertility –regardless of diagnosis— you will optimize your egg quality as well as improve the uterine environment for implantation and gestation of a healthy baby. 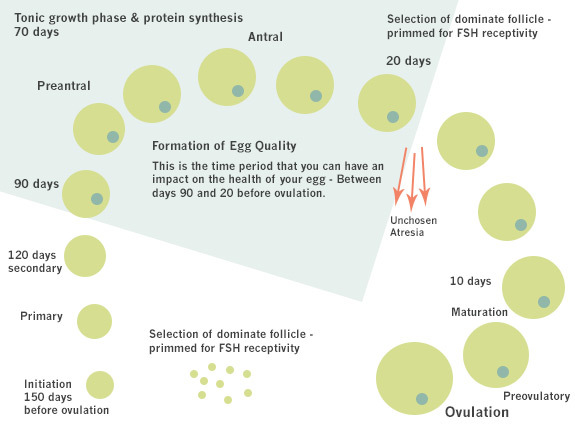 During the one year cycle of a follicle's (containing an egg) journey towards ovulation, there is a period of time when certain factors can affect the health of the eggs that are preparing for ovulation. A key time of maturation is around the 90 days before ovulation, any changes you make will take at least three months to have an effect. Studies show that acupuncture can improve blood flow to the reproductive organs, balance hormones, optimize implantation, and reduce miscarriage rate. Frequency of acupuncture (1-3 times per week) over three or more cycles improves effectiveness. (a) Tarin et al, 2004, Mol Reprod Dev 2004;69:402-410. (b) Wiener-Megnazi et al. 2004, Fertil Steril 2004;82(Suppl 3):1171-1176. (c) Ko KM et al, Phytomedicine. 2006 13(9-10):636-42. One of the most powerful things you can do to minimize the oxidative stress that causes your eggs to age at an accelerated rate is to eat a diet high in antioxidants. Deeply coloured fruits and veggies such as cranberries, blueberries, plums, blackberries yams, beets, broccoli, and carrots are particularly rich in anti-oxidants such as polyphenols. These miraculous compounds clean-up the free radicals and positively affect cell-to-cell signaling, receptor sensitivity, inflammatory enzyme activity, and gene regulation. Whole foods are foods that are in the state that Mother Nature made them (the apple instead of apple juice), minimally processed, and refined as little as possible before being eaten. Slow Carbs. Eat carbs in their natural unprocessed state to cause a slower and lower rise in blood sugar. Slow carbs include beans, peas, lentils, whole grains, vegetables and most fruits. Eating slow carbs helps to minimize insulin resistance, regulate blood sugar, balance fertility hormones, and prevent gestational diabetes. Plant-Based Foods. Include a rainbow of high-fibre, fruits and vegetables, legumes, nuts, seeds, and whole grains. These foods are loaded with antioxidants and phytonutrients that counter inflammation (a common cause of infertility) and nourish your reproductive system. Healthy Fats. Eat fats that are pressed naturally from whole-plant foods (coconuts, nuts, seeds, avocado, olives) or are short-lived, deep sea fish such as salmon, herring, and mackerel. Healthy fats combat cellular inflammation and improve hormonal sensitivity. Strive for a body mass index (BMI) of between 20 and 25 and a waist circumference (WC) of less than 35” for women and less than 40” for men. If you are overweight, losing just 10 lbs. can greatly enhance your chances of getting pregnant. Chronic stress is another factor that speeds up the biological clock. Stress hormones such as cortisol wreak havoc on the body and its systems, interfere with insulin levels, cause weight gain, create inflammation and damage DNA. Chronic stress shuts down all non-essential systems and directly affects the Hypothalamic-Pituitary-Ovary Axis (HPO) that regulates fertility hormones. As well, stress diverts the blood supply away from the ovaries and interferes with your body’s ability to respond to even balanced hormones. Humans are social beings and studies have shown that having a supportive community of family and friends is the most important determinant of mental and physical health. This is particularly important for women who are feeling anxious and isolated. Studies have described a “tend and befriend” response to stress in women where women seem to deal with stressful situations by bonding and nurturing each other. Chemicals and toxic substances that act as endocrine disruptors sugary foods and excess carbs since they leadto a rise in blood sugar and result in inflammation and hormonal imbalances.